What’s the waiter doing with the computer screen? : Jävla skitsystem! When Richard Gatarski and a few friends wanted to dine in the Swedish city of Norrköping a few weeks ago, they booked a table at a downtown Italian restaurant that seemed nice. When they arrived, they were greeted by the headwaiter, who asked if they had a reservation. Richard confirmed, and the headwaiter looked at his computer screen. … and suddenly realized that it was a perfectly ordinary whiteboard felt-tip pen. 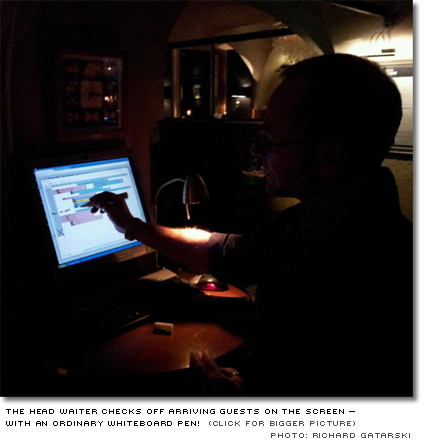 The headwaiter just draw an ”X” over their booking, directly on the computer screen! The food, by the way, was excellent. So, what does this real-world story tell us? Computer systems are not always used as the developers suppose. People are creative. If they can, they will invent ways to simplify their everyday tasks. ”We’re very busy.” Users have a lot of more important things to do at work. The time to learn things, for which the value or purpose is not obvious, is rather spent on things we think are more important (like, making the best sauce the customer has ever tasted). Doesn’t the expense for a booking system seem all wasted here? A small real-world whiteboard would probably have solved the task at hand cheaper and simpler. There’s a possibility that the computerized booking system (as opposed to a real whiteboard) could generate some kind of statistics: number of guest per month, typical reservation profile for a week, percentage of tables booked for any given period … And the companies selling computer systems (of all kinds, in many businesses) usually push the possibilities to get such data as big advantages with their system. But is it worth the effort? In many cases, a headwaiter would probably know most of what really matters anyway from experience or rule-of-thumb. So the hassle of going through a time-consuming number of clicks, just to generate that data, is probably not worth it. And finally: to really find out what’s important to the users, and how a system is actually used, you need to observe real users, in the field. What’s this: I’m a Swedish UX designer and writer, specializing in systems used in the workplace. This blog is about my most recent book, covering how such badly designed systems are a major cause of stress (and eventually health problems). You can read a bit more about it in English here. If you liked this story, you’ll probably also find this real-world example from health care interesting: The doctor that rocks the mouse (Sep 24, 2012). But is it worth the effort? In many cases, a headwaiter would probably know most of what really matters anyway from experience or rule-of-thumb. So the hassle of going through a time-consuming number of clicks, just to generate that data, is probably not worth it. A headwaiter _might_ know that data. But it’s locked up in his head, not in a place where the number-crunchers at corporate can get at it. @brian They could ask him? B2B software development often focuses on the list of features only, features are easier to sell than abstract things like usability. But like this article also shows there is a lot of actual value in simplicity, maybe that is not so easy to put into the bullet points. An engineer will look at this and tell the user they are doing it wrong. A UX person will look at it and see the system is wrong and the user has found a better solution. Great real world example where the proposed system does not match up with user needs. the fifth point missed one, I believe, important factor. nowaday there are many online booking systems, so in order to use them the restaurant must have some sort of a software solution, they can’t rely on pen and paper. I love watching a creative person at work when they’re facing everyday problems. But there are many software solutions out there for online reservation and POS, it’s just bad that someone didn’t try to look for it. full disclosure – I’m one of the founders of POS Sector and love to solve these kind of problems for restaurants! 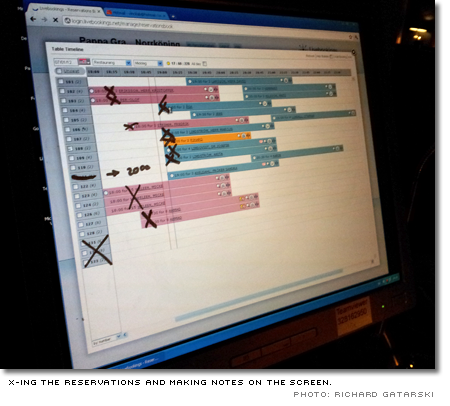 …my uncle owns a restaurant and has one of those booking systems (very expensive). thing is, it doesn’t just track empty tables. his also tracks orders for food and drink (down to the individual based on their position at the table). ’a’ headwaiter and ’a’ restaurant, asking this is reasonable. If you’ve got a chain of restaurants then the problem does not scale. Memories are fallible, people just jotting stuff down is a sure way to get bad data into a system. ’Asking’ in a chain is going to end up being a report for the guy to fill out at the end of shift or end of week. In the end he’s going to see a report-form to fill out, lot of mouse clicks, and it’s going to be a big hassle. Much cheaper / easier / efficient to gather the data while doing business. And we’re back to the POS system being the optimal solution. Nice example of how a poorly-designed UI leads users to find their own, odd-seeming but functional solutions. Comment #4 pretty much nailed it – the user isn’t doing it wrong, the system is. This seems more like a case of the wrong tool for the job that was personalized (white board marker) by the user. The system used seems to be LiveBookings, which promotes itself as an online booking and marketing tool, this is not a restaurant management tool. In its list of features the 1st is ”Print lists of your reservations before service”, for this restaurant this might have been a better solution. A restaurant management solution would more than likely require the headwaiter to allocate the guests to a table, as otherwise the waiter attending them would not be able to put their orders through, those would not be able to print in the kitchen and they would not be able to charge them at the end of their meal. As some commenters said this does not scale, but not only that it does not scale for a chain, if the restaurant was bigger it would not scale if the page need to be scrolled through. I fully agree that the solution found works for the restaurant in case, and that LiveBooking needs to learn from this and improve their UI to a maybe one or two click checking off of a reservation. And maybe this article will get them to add that feature. This is also a great example of how the designers and developers of a system can learn a lot from watching how it is used, and better even used it themselves in real-life situations. I’m very much a backend software engineer/sysadmin but even I can see the problem. The user (head waiter) has identified the problem and a work around, now someone just needs to implement his solution. 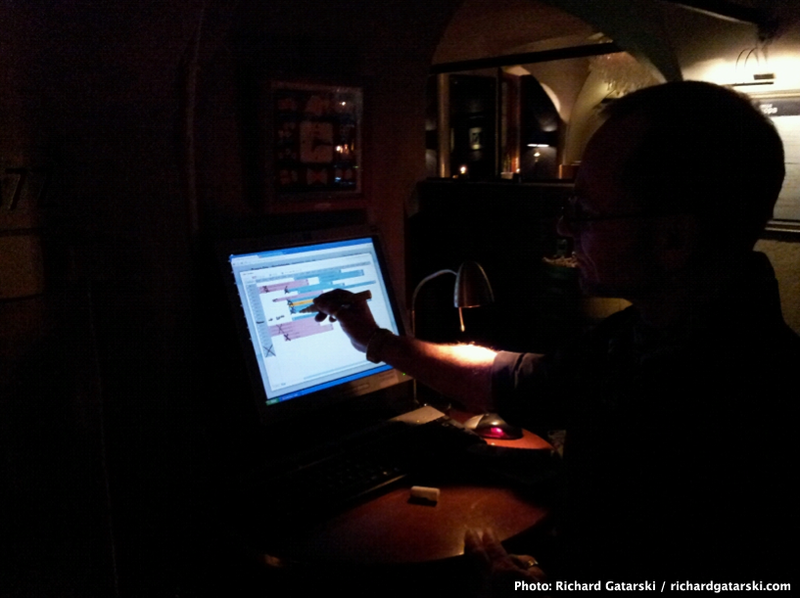 A touch screen friendly interface that allows the user to cross off the tables shouldn’t be too hard to implement. Here in Hungary I know a nice café cocktail bar (Karolina: http://karolina.hu/index.php?lang=1, they are pretty good :)), where the waiters are using PDA-s with touch screen for years now. They were my first and still only experience in the Hungarian catering sector who are making their lifes easier by technology. And the waiters are happy with that, the customers too: when the waiter walks back to the desk after taking my order, all the stuff is prepared for delivery. The SW is not some fancy high-profile one, it is individually developed for their needs. The main thing is: its simple and its fully customized. I think there is also an important responsibility at the customer, he should invest some time to field test and set up his new asset bought for a lots of money. If he fails to do that, that is not the developers fault. As a software developer in a software development company, one problem that we often face is that we are not developing software for the end users, but for the service provider. The service provider mostly cares about whether they can sell the software to their customers or not. The actual user experience is only a minor concern. After all, they already sold the service and the cost of changing a service provider is often too great for individual companies to switch providers due to small usability issues. Too often, the service provides are indifferent towards usability issues and we, the actual developers of the software, never even hear about the usability issues. The service provider will only forward us issues that they find interesting and marketable. This is the kind of thing you would never learn from viewing any type of data analytics on system use. Quite a hilarious story, and completely shows the value of in-person user testing and evaluation. I think it’s interesting how much effort companies go through to get ”real” data without (in this case) just asking the head waiter. As long as you know how to ask the questions, you can often get just as reliable and just as important data from the personal interviews without the potential timesink. It is true that developers/designers must take into consideration how users interact with their applications by observing them live,in the field. On the other hand, shouldn’t the manager of the restaurant test this system prior to purchase, to see if it really fits their needs? The simplest solution must be to give the guy a system where the mouse is removed and replaced with a touch screen. Draw an X on the screen and the software marks the customer’s status. Something like an iPad could be the ideal interface. Being a developer of similar software, we know what it means to be precise, and easy at the same time. We have developed a point of sale system that can be easy-peasy from the get go. No formal training is needed, and you can download our app right from Google Play here. Curious to hear the responses. I think this is pretty hilarious. Users are a critical part/component of any design process. So simple, so missed frequently. areUXperienced? | You want to know how users use the system you designed? You can’t handle how users use the system you designed. web forr thjat reason, and take the most up-to-date information.